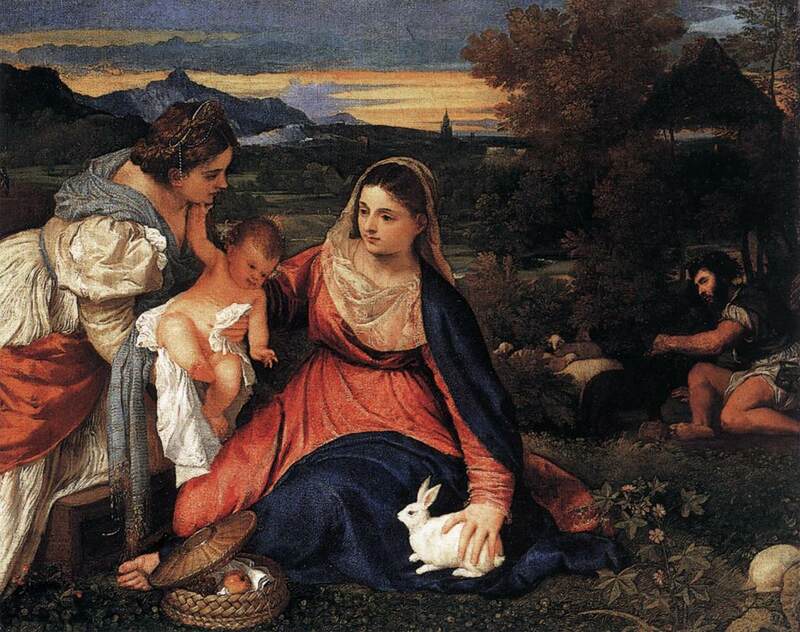 Titian’s so-called “Madonna of the Rabbit,” currently hangs in the Louvre. The Museum’s website notes the popular title but more accurately labels the painting as “The Virgin and Child with St. Catherine and a Shepherd, known as the Madonna of the Rabbit.” Actually, a better title would be “The Mystic Marriage of St. Catherine,” a common devotional subject during the Renaissance. Today, I placed in the page section of this site an interpretive essay on the painting that originally appeared on January 7, 2014 as a post on my blog, Giorgione et al… In the essay I take issue with the Louvre and others about two important details in the painting. In the first place, I do not believe that Titian has depicted a shepherd in this painting. In my interpretation the man dressed in rustic attire in the mid-ground is St. Joseph, the protector of Mary and the infant Jesus. He is often included in versions of the Mystic Marriage by Venetian renaissance artists. Secondly, although the label, “Madonna of the Rabbit” will probably lnever be changed, I disagree with the Louvre’s explanation that the white rabbit is a sign of Mary’s virginal fecundity. X-ray examination has shown that the rabbit was not originally present. Initially, Titian placed Mary’s left arm on her lap. Why, on second thought, did he add the white rabbit? My essay argues that the white rabbit is the equivalent of the Eucharistic host. In addition to the interpretive discoveries listed on the page menu above, I have been writing about Giorgione, Titian, and the Renaissance on my blog site, Giorgione et al…, since September 2010. At the suggestion of Hasan Niyazi, my late Australian friend who created the very popular blog, Three Pipe Problem, I decided to use a blog to attract a wider audience. Since then, there have been almost 300000 page views at Giorgione et al…. Below find a table of contents for the blog site. 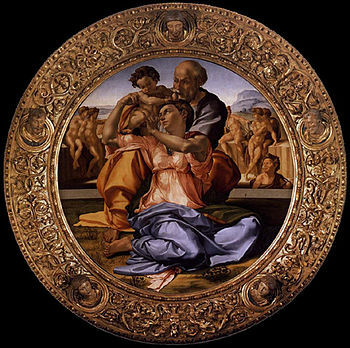 On July 7, 2016 I posted my interpretation of Michelangelo’s Doni Tondo as a page on this site. In my paper I argue that Michelangelo has depicted the Madonna acting as a priest elevating her Child in the same way a priest elevates the Host at the Consecration of the Mass. All the other characters in the painting are related to Mary’s offering. The interpretation was originally published as a series of four essays on my blog, Giorgione et al… between April 4, 2015 and 7/21/2015. I was originally drawn to take a close look at the painting by the discussion of the painting in Timothy Verdon’s, Mary in Florentine Art. I came across the book by accident over a year ago but I found it hard to agree with Verdon’s analysis. I decided to depart from my work on Giorgione and Titian for awhile and enter the world of Michelangelo. It turned out to be a much larger task than I had envisioned. I have to admit that my first essay did not go deep enough and I subsequently had to write three separate ones exploring the roles of Mary and Joseph, John the Baptist, and the nudes in the background more fully. I left my original flawed interpretation on the blog as an example of how easy it is to go astray in discussing Renaissance art. I have put the three revisions together and placed them on this site which contains my most significant interpretive discoveries on Giorgione and Titian. Below are some of the sources that I have used in trying to understand the Doni Tondo. D’Ancona, Mirella Levi : “The Doni Madonna by Michelangelo: An Iconographic Study.” Reprinted in Michelangelo, Selected Scholarship in English, edited with Introduction by William E. Wallace, New York and London, 1995, V. 1.Life and Early Works, p. 403-412. (numbers in brackets refer to the pages in the Wallace collection).This study first appeared in the Art Bulletin in 1968. Franceschini, Chiara: “The Nudes in Limbo: Michelangelo’s “Doni Tondo” Revisited”, Journal of the Warburg and Courtauld Institutes, Vol. 73 (2010), pp. 137-180. Goffen, Rona: Renaissance Rivals. Yale, 2002. Hayum, Andree: “Michelangelo’s Doni Tondo: Holy Family and Family Myth.” Reprinted in Michelangelo, Selected Scholarship in English, edited with Introduction by William E. Wallace, New York and London, 1995, V. 1.Life and Early Works, p. 417-459. This paper first appeared in Studies in Iconology, 7-8 (1981-2), 209-251. Olsen, Roberta J. M. : The Florentine Tondo, Oxford, 2000. Steinberg, Leo: “Michelangelo’s Doni Tondo,” Vogue, December 1974, pp. 138-39. Verdon, Timothy: Mary in Florentine Art, Firenze, 2003. Wallace, William ed. : Michelangelo, Selected Scholarship in English, New York and London, 1995. In addition to the articles on the Doni Tondo mentioned above, this three volume collection contains a number of papers on the Sistine Chapel that shed light on the Doni Tondo. Whitford, David: The Curse of Ham in the Early Modern Era, Ashgate, 2009. In 2010 I created this site as a repository for my re-interpretations of some of the greatest and mysterious works of the Venetian Renaissance. First, in 2005 I identified the subject of Giorgione’s “Tempest” as “The Rest of the Holy Family on the Flight into Egypt.” For 500 years this famous painting had eluded identification. Innumerable interpretations have been put forward but all have been shot down. Second, I have identified the subject of Giorgione’s so-called “Three Ages of Man” that now hangs in the Pitti Palace as “The Encounter of Jesus with the Rich Young Man.” There has never been any scholarly agreement on the subject of this painting either. Third, I have identified Titian’s equally mysterious painting, “Sacred and Profane Love,” as “The Conversion of Mary Magdalen.” Up to now this famous painting that hangs in the Borghese Gallery has also eluded identification. Fourth, I have identified the subject of the Louvre’s equally mysterious “Pastoral Concert” as Titian’s “Homage to the Recently Deceased Giorgione,” using the Biblical story of David and Jonathan as a template. A number of other discoveries have flowed from these new interpretations of the work of Giorgione and Titian. Some can be read on this site, and others at my blog, Giorgione et al… http://giorgionetempesta.blogspot.com. I presented a shortened version of my paper on Giorgione’s “Tempest” in Venice in 2010 at the annual meeting of the Renaissance Society of America. In 2011, I also presented it with some additional material in St. Louis at the annual meeting of the South Central Renaissance conference. In March 2012, I presented a shortened version of the paper on “The Sacred and Profane Love” at the meeting of the South Central Renaissance conference in New Orleans. I am not a professional art historian. I hold a PhD in History but left academe some 40 years ago to pursue a career as a financial advisor. Late in my career I developed an interest in Italy and the Renaissance and made my discovery about the “Tempest” only in 2005. A short version of the interpretation appeared in the Masterpiece column of the Wall St. Journal in May, 2006. Otherwise, these papers have never been published in traditional media. Note: Because of spammers I plan to limit comments on this site. I will be happy to respond to any legitimate comments via email. I I am also available to offer presentations on the papers presented here.